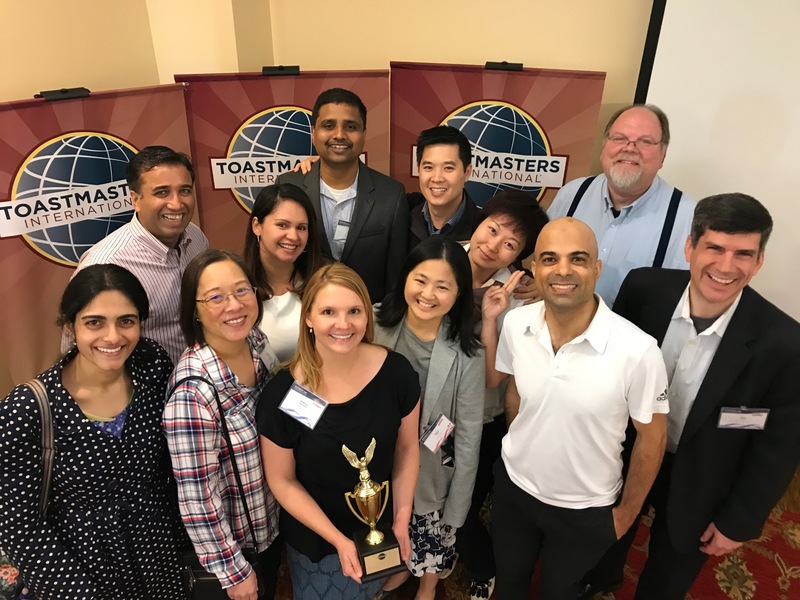 Note: Rebecca Boorsma won third place at the District 101 Table Topics Contest on May 20, 2017. She represented the Macintalkers. Here is her account of competing in the Club, Area, Division and finally District level. Most of us fear the dreaded Table Topics question. We feel our heart racing when the question is asked, we avert our eyes from the Table Topics Master, and we cringe when our name is called. I am the exact same way but somehow I managed to compete and win at the Division level moving onto District and placing third. Today, I would like share my path to the District Contest covering where I began as a Table Topics speaker, how I prepared for the District Contest, and how it felt to compete at that level. Where I began as a Table Topics Speaker is likely relatable to everyone reading this. When I answered my very first Table Topics question, I lasted about 30 seconds and stared at my feet the entire time. I quickly sat down and vowed to never answer a Table Topics question again. Luckily for me, that’s not an option in Toastmasters. In fact, one day, I had been stuck in horrific traffic. I lived and worked four miles from the meeting but it took me 40 minutes to get there. Coincidentally, I was asked a question about public transportation and I went on an angry rant about the lack of public transportation in the area. Everyone loved it. Next thing I knew, I was answering questions every week because people wanted to hear my angry rants. With time, my angry rants became more polished performances with a succinct introduction, middle, and conclusion. My path for Table Topics Speaker therefore went from an insecure individual to a pretty confident performer. But the key to that transition was practice, as was the key to competing at the District level. In order to prepare for the District Contest, I practiced, I solicited feedback, and I came up with little stories or phrases I could drop in if need be. I practiced so much before the District Contest. I practiced every day either alone or with my husband. I visited other clubs in the area and division in order practice answering questions in an unknown environment. Other members of Macintalkers would host dinner parties and I’d practice there as well. It got to the point where I was so tired of answering questions. In addition to that, I solicited feedback from everyone. I asked the second place winner from the Area Contest his tactics and recommendations, I asked individuals who had competed at the Division or District level for their tips and tricks, and I asked everyone in my club to give me last minute input into my performance. I am hoping I took everything on board but I have a feeling, because of my nerves in the moment, the only thing I really did was smile big. One bit of advice I found particularly helpful was preparing stories or phrases that I could drop in as needed. For example, if the question was about change or something new in my life, I could talk about getting married and changing from a friend, to a girlfriend, to a fiance, to a wife. I also went from having a friend, to a boyfriend, to a fiance, to a husband. With this change, I received a new name and a new bank account that was full. There’s a myriad of ways to craft this story in order to answer the question at hand and I worked on altering it just in case I could drop it in during the contest. I also developed little phrases I thought had impact like “GREAT AND POWERFUL TECH COMPANIES but itty bitty living space” or “Before you ask, no, I’m not with child, this is a food baby.” The thinking here is again to be able to drop in items as needed rather than coming up with something new on the spot. At this point in my path to the District Contest, I went from being an insecure Table Topics speaker to a pretty well practiced individual. On the day of the contest, I was remarkably relaxed. Not only that, I was excited. I had been feeding off everyone’s energy and passion. This allowed me to just enjoy the moment and the contest itself felt natural. When the Table Topics Master asked the question, I was elated. It was perfect. The question asked was about pursuing passions or pursuing paychecks. I could not have had a better question. I was able to simply tell my story about my career. I had immense experience trying to pursue my passion but because of the economic fallout in 2008, that was no longer a viable option. From there, it was no longer about pursuing my passion but being forced to pursue a paycheck and making the best of the situation. When I placed third, the moment was fantastic. Everyone was so excited, there were high fives all around. The support and excitement there made all of the practice worth it. And there you have it: My path to the District Contest started with my vow to never answer another table topic question until I discovered the power of angry rants. The angry rants led to almost weekly practice at the club level which in turn helped with my practice to prepare for the District Contest. The practice, feedback and prepared stories or phrases led me to feeling natural and confident plus the excitement everyone showed allowed me to revel in the moment. I hope this path encourages you to answer more Table Topics questions even though your heart might race and you might cringe when your name is called. You never know what will happen on your path with Toastmasters.